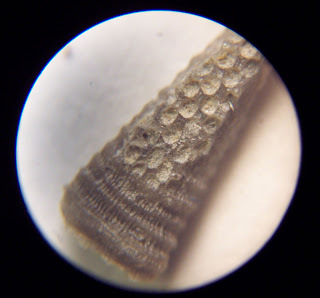 This microscope image of an Ordovician Period cornulite worm tube with a bryozoan growing on it. I guess it could be the other way around with the cornulite growing on the bryozoan. It looks like the bryozoan fragment was part of a larger colony. Fossil found in the Kope Formation of Carroll County, Kentucky. Viewing circle represents about 3.5 mm in diameter. Magnification at 40 times.